Hotel Club Arenal is situated in the Playas del Este (Eastern Havana Beaches) area, right on Santa Maria Del Mar, a public beach with crystal-clear waters surrounded by the beautiful Itabo Lagoon, natural habitat of red mangrove, beach berries and many species of fish and birds. 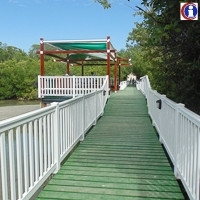 The 4-stars Club Arenal resort is located only 27 km (16,78 miles) from Havana City that is just a 25-minutes drive. From Thursday to Sunday there is a free shuttle bus to Havana, leaving Club Arenal at 10.00 am and returning at 4.30 pm. 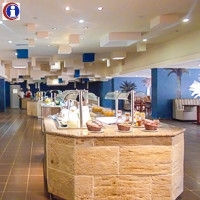 The all-inclusive Hotel Arenal consists of 3 two-storey buildings where the rooms are located; a buffet restaurant serves Italian style food and Espresso Coffee; the snack bar "Parrillada", which offers late breakfasts and light lunches or snacks during the day and fish and lobster dinners (for an additional fee and by reservation only) during the evening and where ice cream is always available (extra fee). 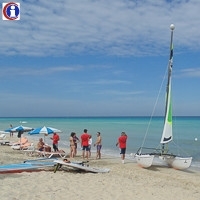 At Club Arenal Hotel lots of entertainment activities are offered; there are a full range of watersports such as catamaran, pedal boats, windsurfs, canoes and kayaks and fields sports including volleyball, tennis and table tennis. In the evening, you can also join the hotel's disco. 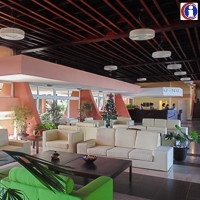 Hotel Club Arenal has only very recently re-opened its doors to an international market, after renovation works and many years of Italian agencies exclusivity; during this period it was known as Hotel Bravo Club Arenal. 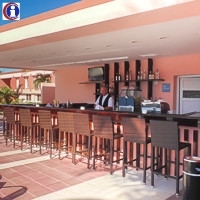 The maximum capacity of the standard rooms at Club Arenal is 2 adults, they are located on the ground floor and freature a large brighth window. Junior Suites at Club Arenal Hotel are recommended for families as their capacity is higher than the standard rooms and they can accomodate up to 2 adults + 2 children or 3 adults. Junior Suites have a living area and are located on the first floor. Bacuranao pludmale ir vistuvāk Havanai, un, stingri runājot, atrodas Celimar, Habana del Este rajonā. Caur pludmali plūst saldūdeņu Bacuranao avots. Tūristiem nav viegli atrast šo pludmali, taču tas ir populārs starp vietējiem un Havanas iedzīvotājiem. Playa Santa Maria del Mar ir patīkama, diezgan tukša pludmale, bet nedēļas nogalēs ir pārpildīta ar Havanas iedzīvotājiem. Pludmalē ir baltie smilši ar koraļļu un čaumalu paliekām. Tās ūdeņi ir kristāldzidri ar zaļiem un ziliem krāsu toņiem. Santa Marijas zemūdens parāda skaistu ainavu uz koraļļu rifiem, vēžveidīgajiem un dinamisku krāsu zivīm. Ienirt šajos ūdeņos ir lieliska pieredze, tos faunas un satricošas bagātības ainavas dēļ. Guanabo ir burvīga piejūras pilsēta ar lielisku pludmali un naktsdzīvi, kas piedāvā daudzas diskotēkas. © 2012 Nigel Hunt - All Rights Reserved.